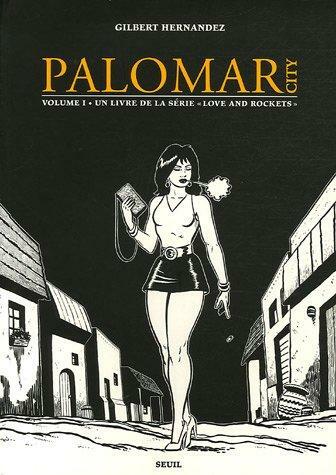 Well, a friend just lent me the first three Love and Rockets by Jaime, Mario and Gilbert Hernandez. I found the first volume to be a bit early days, a sketchy representation of what the artists would ultimately do. And then the books took off pretty much in the second volume. While there are many attractive elements to Love and Rockets, two aspects of the collections drew my attention immediately. I was smitten with Gilbert’s Palomar stories, a moody serio-comic about life in a tiny town. Characters range from caricature to real from panel to panel, and the emotions of the town are heartfelt and real. Think Winesburg, Ohio for the modern reader, and you have a feel for the literary quality of Palomar. Yet, aspects that are off kilter belong uniquely to this artist. I look forward to more of this. Good pop culture stuff. However, it wouldn’t hold me as much as the life story in Palomar does…except that Locas has Rena Titanon, an incredible woman in her 40s who has lived large (wrestler, revolutionary, 40s bombshell) and who is coming to terms with her age. I can’t look away. I had always meant to read Love and Rockets, but it might be possible that I’ve given myself a gift by waiting until I’m at this point in my life. My reading now, in my 40s might be more nuanced, and less surface than having read them 20 years ago. I’m going to recommend the series. There is an element of sexuality, but not sexism. And there’s an element of Bohemianism as well. However, I guess Love and Rockets is like a complicated wine: what you taste at first isn’t the taste that lingers as you look a little closer. You’ve still only scratched the surface of Jaime’s work! What you’re going to find in the end is a slow building, more nuanced work than Gilbert’s. When you’re finished and you look back on it, the first couple volumes of Locas might seem a bit out of place, but in their own way, they fit — if you’re the type of adult who understands your youth as a sort of way out fantasy where any old crazy thing could and did happen. Wow, enjoy your first read of L&R! That sounds really provocative. I am the type of adult who understands my youth in that way.